SUMMARY: Racial and ethnic gaps in wealth are substantial and persistent. The wealth of a the typical white household in 2013 was 13 times that of the typical black household and 10 times that of the typical Hispanic household. Social Security is a crucial component of most Americans’ financial security in retirement and makes up the vast majority of retirement wealth for most households of color. The gap in Social Security wealth between white households and households of color is substantially less than the gap in holdings of pension and IRA wealth. 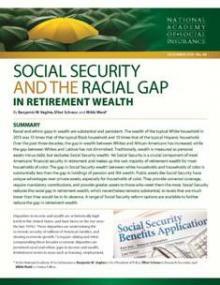 As a result, Social Security has a unique advantage to reduce the gap in retirement wealth for households of color. It provides universal coverage, requires mandatory contributions, and provides greater assets to those who need them most. A range of Social Security reform options are available to further reduce the gap in retirement wealth. Download the brief.